Jessica Jane is an exhibiting artist, illustrator and designer from Melbourne, Australia. Her work can be described as whimsical and feminine with interests in nature, animals and costume. 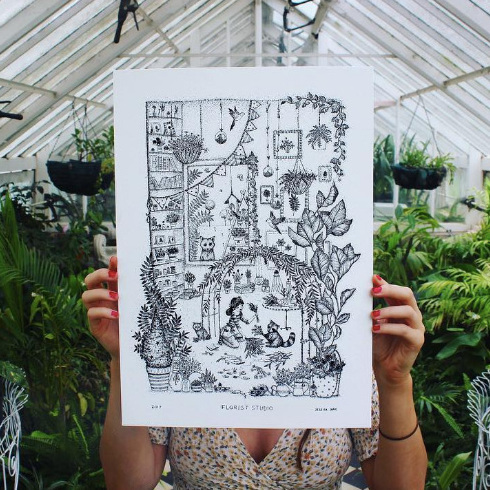 Her detailed ink drawings are inspired by nature and traveling, often visualising flora and fauna she has referenced with self captured photography when exploring. Jessica’s products include original artworks, giclee prints, cards, zines, wrapping paper, stickers, badges and more! Matt Duncan is a graphic designer and printmaker and has been producing linoprints since 2010. He loves the graphic qualities of this medium; strong contrast, crisp lines and flat colours, and enjoys the physical aspects to producing linoprints. Matt also has an interest in typography and Scandinavian design. He incorporates these two themes in typographic posters that can be customised with your favourite song lyrics, quote or names of your family members!